The collective expertise of the Google Map Maker community has benefitted millions of people who use Google Maps. Users have helped put cities, road networks, and universities on the map for the first time in over 187 countries and regions. Now, users have the ability to contribute more than their mapping edits; they can also share their experiences, knowledge, and local expertise. Map Makerpedia is a new crowdsourced guide for Google Map Maker that features lessons, articles, and tutorials. 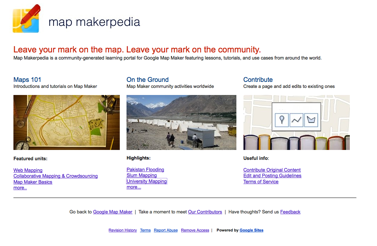 Alongside the Lat Long Blog and Map Your World community, Map Makerpedia is part of Google’s effort to highlight the contributions of individuals and organizations. Similar to a Wiki, the site allows users to both submit content and make edits. Students at the University of Ibadan in Nigeria are using Map Makerpedia to showcase their campus mapping project. Their contribution is more than a simple account of activities taking place but also contains information on event planning, preparation, and important challenges faced. These experiences serve as a guide for groups in other schools to follow, and these groups, in turn, can share their own experiences on the university mapping page. Map Makerpedia features a ‘Maps 101’ section, which puts Map Maker tutorials in a lesson-based form. Additionally ‘Map Maker on the Ground’ highlights the unique applications of the tool in the field, such as flood mapping in Pakistan, health mapping in Africa, and slum mapping across the world. Map Makerpedia was designed for flexibility and collaboration at all levels, from new submissions to revisions. The initial design and much of the original content was shaped by the Map Maker Advocates, as well as Dr. Rob Lemmens from ITC. Google Map Maker allows users to add and update geographic information for millions to see. Map Maker encourages users to make their mark on the map. Map Makerpedia enables users to build their Map Maker knowledge and also make their mark on the greater community.